Value. When you’re shopping for a queen size mattress, you want to find the best quality and comfort at the lowest price. After all you’re going to be spending at least 7-8 hours every night in your new bed. You want to get a good night’s sleep but also make sure your mattress is built to last. Unfortunately many mattress sales feature prices that seem too good to be true and you end up with a subpar mattress. To help you get started, here are three of our most popular affordable queen mattress sets—all are under $600. Each mattress is made in the U.S.A. and includes a 10 year non-prorated manufacturer’s national warranty which means you’re covered even if you move to another state. 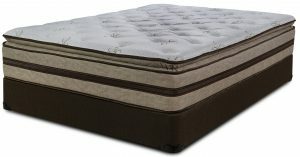 Dreamhaven Queen Mattress Set by Serta. Serta has been one of the most respected mattress brands for more than 80 years. Their Dreamhaven Dunes West Plush mattress offers a comfortable medium-firm sleep surface. Features include Gentle Support Foam®, Flexband Gel, Latex and Memory Foam and Wrapped Coil Innerspring system for back support. Sealy Crown Jewel Black Opal Cushion Firm Queen Mattress. This queen mattress features StabilityPlus Coil (strong and durable), Coresupport center (reinforced center with Gel Foam), StableEdge System (extra firm coils on the edge for no roll off feel) – and a medium cushion feel. Queen Catalin Pillow Top by Englander. Englander prides itself on providing the best mattress value to fit everyone’s budget. Their Catalin Pillow Top queen mattress offers all of the bells and whistles you’d expect from a top-of-the-line mattress. Features include gel memory foam, individually encased steel coils to limit motion transfer, and box spring. In addition to the base price, when you’re shopping for the best queen mattress deals it’s also important to watch for hidden fees. At Sleep Pittsburgh, every queen mattress purchase includes our Always Free Next Day Delivery anywhere in Allegheny County and Everyday Low Price Guarantee. Choosing a mattress to fit your sleep preferences and budget can be overwhelming. If you’d like to learn more about any of the queen mattress sets above, give us a call at 412-462-7858. You can also visit our Pittsburgh showroom to test out each mattress type. We’re only one block from The Waterfront. Pittsburgh's original discount mattress store since 1946!